Don't miss the LEGO Friends Snow Festival! LEGO® Australia is hitting the slopes these school holidays to celebrate the new LEGO Friends Snow resort range. 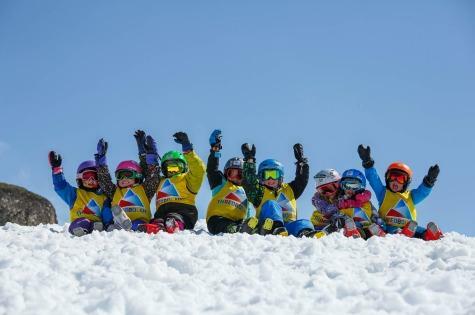 Skiers and boarders will be able to take a break from the mountain to play and build in Thredbo Village with LEGO Friends. Skiing just got a whole lot more fun with the LEGO Friends Snow Hunt – help the LEGO Friends find their skis and snowboard hidden at secret locations on the Thredbo Mountain. Simply snap a pic and head to the LEGO Friends Play Zone for the chance to win a LEGO Friends gift. LEGO Friends stars Stephanie, Olivia, Emma, Mia and Andrea will be transformed and surprise fans on the mountain appearing in a giant snow sculpture, measuring several metres. The new range features four new snow sets allowing kids to expand their Heartlake City collection and celebrate more friendship moments together with the LEGO Friends. The new Snow Resort range includes an Off-Roader, Ice Rink, Chalet and Ski Lift. The Friends are also writing a travel blog, creating exciting videos at various destinations including on the slopes! Head to Thredbo to check out the new range, join in LEGO Friends play and take home a LEGO Friends gift. The LEGO Friends area will be open daily from 3:00pm-6:00pm from Saturday 1 July – Saturday 15 July. Snow lovers are invited to share in the fun by sharing their experience on social using the hashtag #LEGOFriends. I am very excited to see LEGO Friends Snow resort range headed at Australia. I couldn’t watch live video. Now moving to see it and will post the experience at my website custom essay writing service soon. This is obviously one great post. Thanks for the valuable information and insights you have so provided here. being covered also on this web site so cheers for taking time to discuss this!